For a while now (since the blog was started, to be precise), we have received several inquiries on whether Sooo Many Stories is a book club or whether we know of any book clubs that we can recommend to people. As all you book lovers know, there is a greater joy that comes from reading a book and sitting down to discuss it with like-minded people. The other great thing I learnt from belonging to a book club was that sometimes, you ended up reading a book that you wouldn’t have picked up on your own in the first place. And so here we are: The Fireplace. This is a place where we come to celebrate storytelling as readers, writers and book lovers. Sooo Many Stories is organising reading sessions for your children aged four years to 11 years under The Fireplace: Tot Tales. We have met many parents that do not know how to encourage their children that have shown interest in books or what books to get for them. There are efforts to help with this such as The Malaika Mobile Library that is run by the very passionate Rosey Sembatya that delivers books to your child to read every week and 404O’s efforts to improve literacy. But we still need more. For two hours at The Fireplace, we get to go on a story adventure with the children; reading to them stories and doing fun comprehension activities. 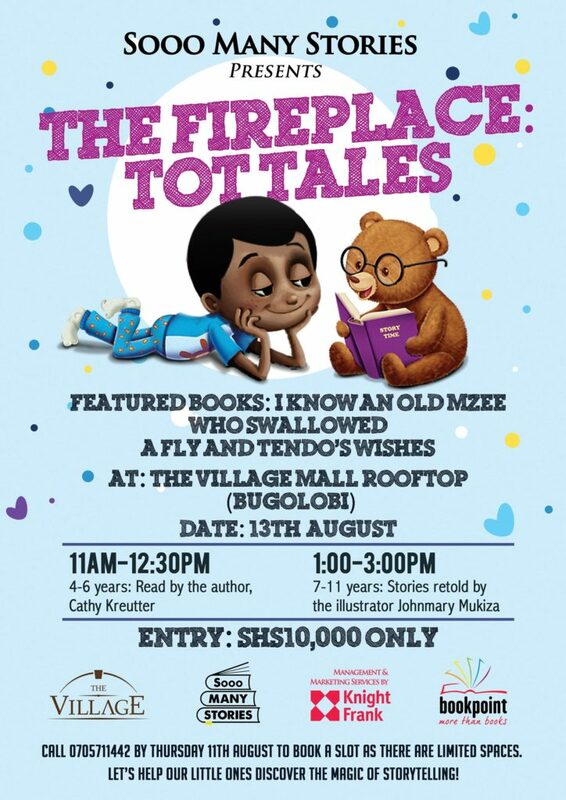 Our first Tot Tale Fireplace will take place on Saturday 13th at The Village Mall in Bugolobi as detailed below. Cathy Kreutter will be reading her books The Old Mzee who Swallowed A Fly and Tendo’s Wish and Johnmary Mukiza, the illustrator of the two books will retell the stories using illustrations. After our interaction with teenagers we have not only found a scarcity of reading material but also the lack of a community where they can share their thoughts on books. We would like to help your teenager to be a part of a book club under The Fireplace: Storyported! The first Storyported! will be held on September 10th and we will let you know what book they will be reading and discussing. Please save the date. The groups will be divided into 12-14 year olds and 15-17 year olds to cater to their different levels of reading. But what about you who is reading this and looking for a group of like-minded people to share great books with? The Fireplace: #MeIread is for you. I once belonged a book club that we used to host in our different homes. Sometimes we met in Bunga, other times in Mpererwe and other times in Najeera. We haven’t met in a while now and although there are other reasons for not meeting, the location factor was was one of the reasons. This is why we would like to match you up with people that live in your area and have similar interests to make it easy for you to meet more regularly. The books do not have to be literary. As long as you are reading, we would like to make it easy for you to meet. 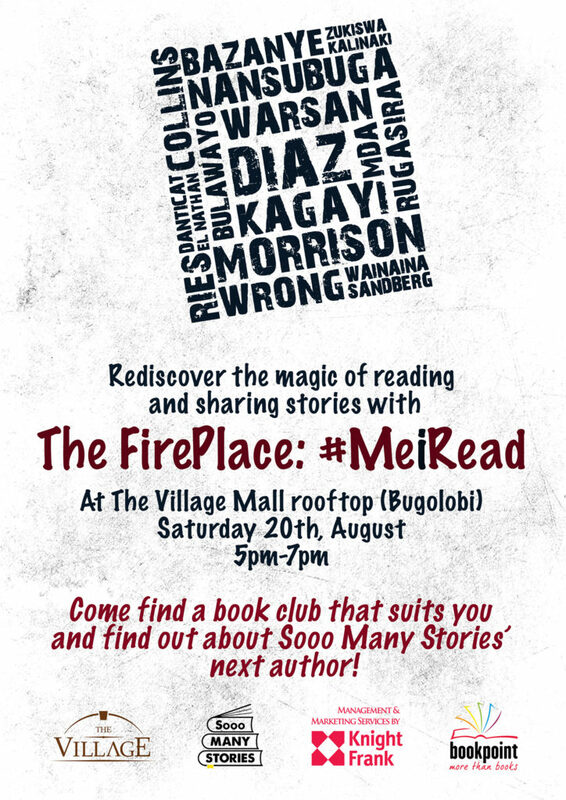 Please follow this link http://somanystories.ug/bookclubs and register and let us know where you stay and the books you love. We are looking forward to seeing you at the designated fireplaces!